Found this March 1976 Toronto Sun article in an old scrapbook. 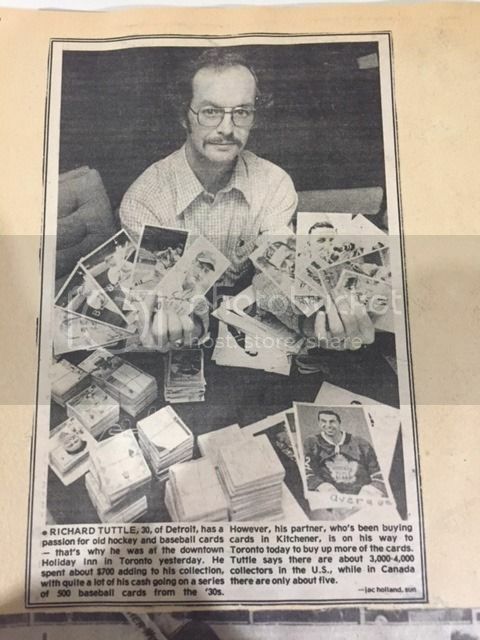 Apparently there were only 5 serious collectors in Canada at that time. Times have certainly changed since then! Last edited by Jon; 03-27-2017, 12:34 PM. We should move this to the main forum. How did he come up with 5 collectors? Sure....feel free to move if you like. Not sure how he came up with 5.....maybe becasue he paid $700 for more than 500 cards from the '30's! Does anyone know what happened to this collector, Richard Tuttle? Today he'd be around 70 years old. Did he sell his collection in the 1980s or 90s? Did he sell them recently and make millions?